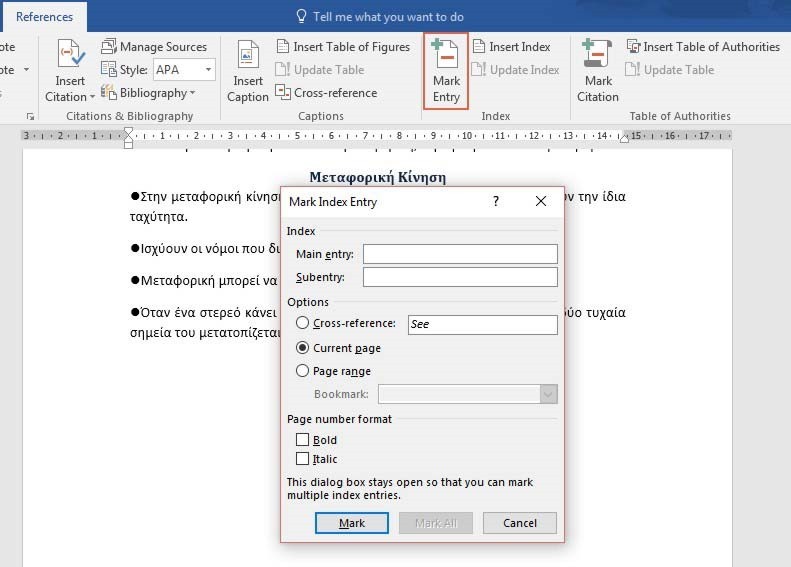 This entry was posted in Word 365 ProPlus Greek and tagged Bookmark, Columns, Create An Index In Word 2016 Document, Cross-reference, Current Page, Entry, Αναφορές, Δευτερεύουσα, Δημιουργία Ευρετηρίου Σε Έγγραφο του Word 2016, Εισαγωγή Ευρετηρίου, Κύρια, Καταχώρηση, Παραπομπή, Περιοχή Σελίδων, Σήμανση Καταχωρήσεων Ευρετηρίου, Σήμανση Καταχώρησης, Σελιδοδείκτης, Τρέχουσα Σελίδα, Main Index Entry, Mark Entry, Mark Index Entry, Microsoft Office 2016, Microsoft Word 2016, Office Smart, officesmart.wordpress.com, Page Number Format, Page Range, References, Smart Office, Subentry, tips4msword.wordpress.com, Type of Index. This entry was posted in Word 365 ProPlus English and tagged Bookmark, Columns, Create An Index In Word 2016 Document, Cross-reference, Current Page, Entry, Main Index Entry, Mark Entry, Mark Index Entry, Microsoft Office 2016, Microsoft Word 2016, Office Smart, officesmart.wordpress.com, Page Number Format, Page Range, References, Smart Office, Subentry, tips4msword.wordpress.com, Type of Index. 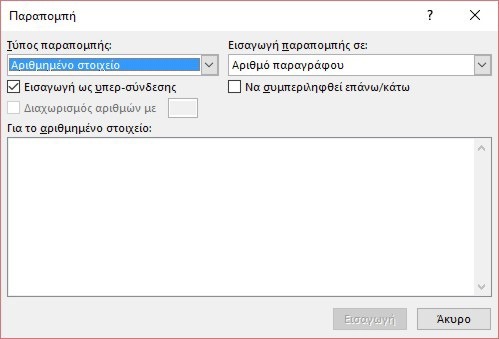 This entry was posted in Word 365 ProPlus Greek and tagged Bookmark, Cross Reference in Word 2016 Document, Endnote, Equation, Figure, Footnote, For Which Numbered Item, Heading, Include Above/Below, Insert, Insert As Hyperlink, Insert Reference To, Αρίθμηση Σελίδων, Αριθμός Σελίδας, Αριθμημένα Στοιχεία, Αντικείμενα, Επικεφαλίδες, Εισαγωγή Παραπομπής Στο Word 2016, Εισαγωγή Παραπομπής Σε, Εισαγωγή Ως Υπερσύνδεσης, Εξισώσεις, Να Συμπεριληφθεί Επάνω / Κάτω, Σελιδοδείκτης, Υποσημείωση, Microsoft Office 2016, Microsoft Word 2016, Numbered Item, Office Smart, Office System, Page Number, Paragraph Number, Paragraph Number (Full Context), Paragraph Number (No Context), Paragraph Text, Reference Type, Smart Office, Text. This entry was posted in Word 365 ProPlus English and tagged Bookmark, Cross Reference in Word 2016 Document, Endnote, Equation, Figure, Footnote, For Which Numbered Item, Heading, Include Above/Below, Insert, Insert As Hyperlink, Insert Reference To, Microsoft Office 2016, Microsoft Word 2016, Numbered Item, Office Smart, Office System, Page Number, Paragraph Number, Paragraph Number (Full Context), Paragraph Number (No Context), Paragraph Text, Reference Type, Smart Office, Text. 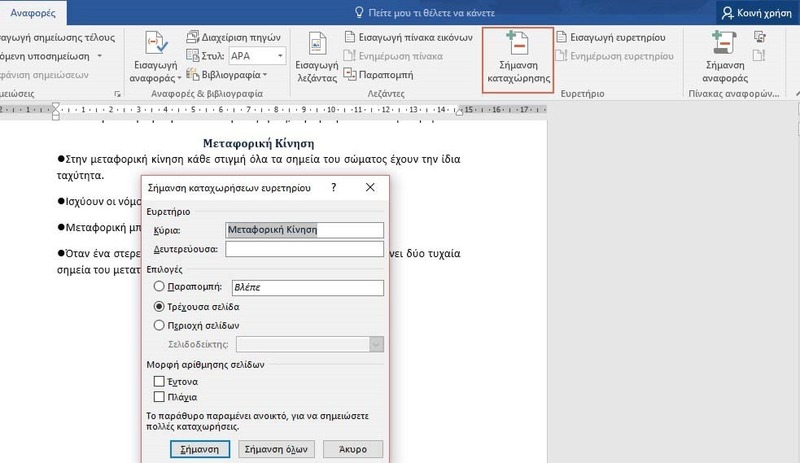 This entry was posted in Word 365 ProPlus Greek and tagged AutoText, Building Blocks Organizer, Document Property, Field, How To Use the Quick Parts Gallery in a Word 2016 Document, Αποθήκευση Επιλογής Στη Συλλογή Γρήγορων Τμημάτων, Αυτόματα Κείμενο, Γρήγορα Τμήματα, Εισαγωγή, Εισαγωγή Γρήγορων Τμημάτων Σε Έγγραφο του Word, Ιδιότητα Εγγράφου, Κατηγορία, Μπλοκ Δόμησης, Οργάνωση, Οργάνωση Μπλοκ Δόμησης, Πεδίο, Microsoft Office 2016, Microsoft Word 2016, Office Smart, officesmart.wordpress.com. 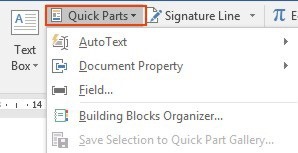 tips4msword.wordpress.com, Properties, Quick Parts Gallery, Save Selection To Quick Parts Gallery, Smart Office. This entry was posted in Word 365 ProPlus English and tagged AutoText, Building Blocks Organizer, Document Property, Field, How To Use the Quick Parts Gallery in a Word 2016 Document, Microsoft Office 2016, Microsoft Word 2016, Office Smart, officesmart.wordpress.com. 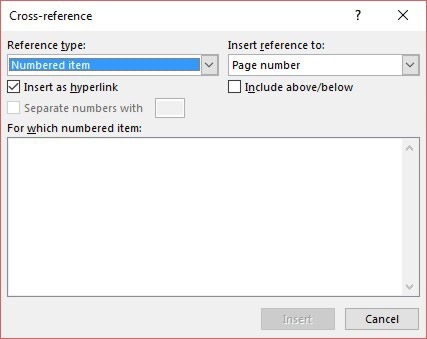 tips4msword.wordpress.com, Properties, Quick Parts Gallery, Save Selection To Quick Parts Gallery, Smart Office. This entry was posted in Word 2010 English and tagged Browse For Themes, Choose Theme, Reset To Theme From Template, Save Current Theme, Themes.